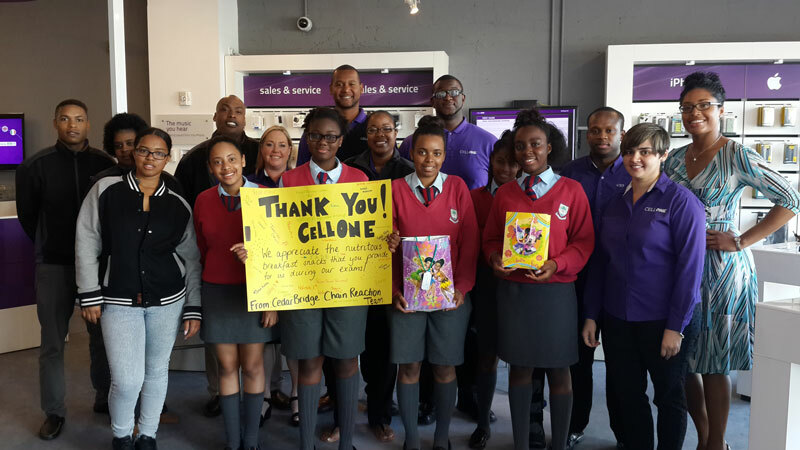 Employees of CellOne were given an unexpected token of gratitude and kindness, when students from CedarBridge Academy’s Chain Reaction Movement visited the corporate and retail offices of CellOne. Students from the ‘Target Letters’ subset of the Chain Reaction Movement decided to target CellOne because of the company’s consistent and regular visits to CedarBridge Academy during every exam period. “CellOne has committed to this endeavor and has utilized its staff to serve a nutritious breakfast to every student for the duration of the week of each exam period. Many students benefit from this endeavour, and look forward to being treated with a healthy breakfast before sitting their school exams,” a spokesperson said. “As a result of the gracious hand extended by CellOne to the CedarBridge Academy students, the Chain Reaction Movement ‘Target Letters Team’ surprised members of the CellOne ‘Food for Thought’ team by showing up at their corporate and retail offices with handmade posters signed by a number of students, and a number of nutritious snacks to return the favor to the staff. “Members of the CellOne team were both surprised and appreciative of the act of kindness shared by the Chain Reaction Movement, and it was truly a heart-warming exchange of hugs, hand-shakes, and kindness. This is an excellent demonstration of gratitude. may all of the students ‘pass it forward’ during their lifetime.